Make this traditional style miniature fireplace from scraps of craft wood or heavy card, or pieces salvaged from craft store miniatures. This easy project requires few tools and basic materials and can be built from standard sizes of craft wood. If you prefer, you can also build it from illustration board or bookboard. The version shown here was 'bashed' from materials taken from a simple big box store, unfinished dolls house hutch. The instructions for finishing bare wood or card to a faux mahogany finish are given in a separate set of instructions. To finish the fireplace, you can make a glowing or flickering fire using LED lights which give off very little heat. The fire can be operated from a 9-volt battery, or wired to work with a transformer. The materials you need for a scale fireplace will depend on the dollhouse or model scale you wish to build it in. The fireplace above was built from a pre-built kitchen hutch available for around $1 in big box craft stores in North America. This makes a fireplace which is slightly lower than you might want but is a good width for a standard fireplace. Determining the Size of Your Fireplace - To determine the materials needed for a fireplace in your particular scale, you need to work out how wide, tall and deep you want the fireplace/mantelpiece to be. To fit a glowing firebox, most 1:12 scale fireplaces are 1 to 1 1/2 inches deep on the sides, anywhere from 3 1/2 to 5 inches wide, and 3 1/2 to 4 inches high. If you have figures for your scene, we normally expect the height of the fireplace mantel to be at elbow height on an adult male figure, about 3 to 3 1/2 feet in full size. Once you have decided on the measurements of your fireplace, you can use the lists below to calculate what you will need. It helps to read the instructions for construction through at least once before you work out your wood amounts. For the Basic Box Length of strip wood or bookboard (illustration board) which is as wide as you want your fireplace to be deep, and an appropriate thickness to represent wood one to two inches thick in scale. You will need two lengths and two widths for the basic box of your fireplace. For the Mantelpiece A piece of wood slightly thicker if possible than the wood for the sides, and sufficiently long and wide to leave an ​appropriately sized overhang when placed across the top of your basic box (roughly 1/4 inch wider than the width of your fireplace, and 1/4 inch deeper than the sides of your fireplace). For the Fire Surround Two pieces of wood equal to the length and width of the sides of the fireplace, minus the thickness of the top and bottom firebox pieces. One piece of wood equal to the width of the sides of the firebox, and the length of the firebox width, minus the thickness of the two firebox sides. This forms the top of the fire surround. For the Hearth One piece of wood or card equal in thickness to the base of the firebox and the length of the mantle, and roughly one foot to one and one half feet wide (in scale). For a 1:12 scale fireplace hearth this would be a strip 1 to 1 1/2 inches wide, and 1/2 inch longer than the width of the firebox. 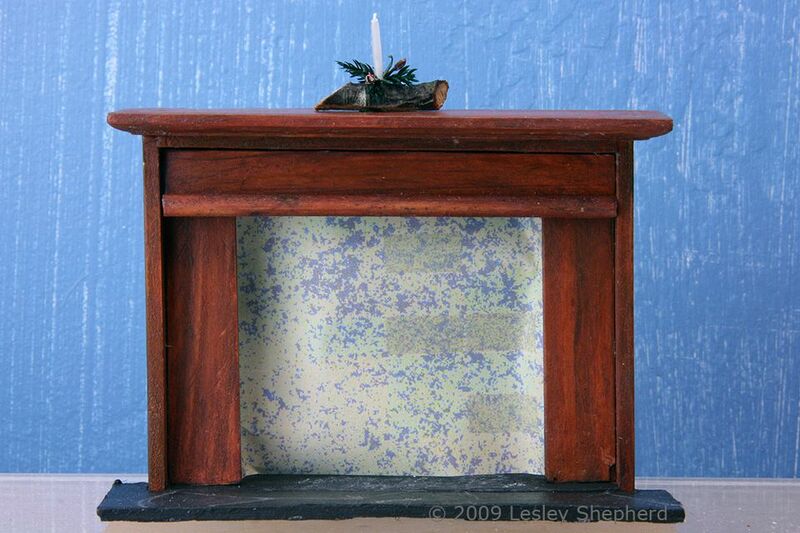 To begin making a fireplace from the inexpensive dollhouse hutch, separate the top of the hutch from the bottom. The large shelf in the middle of the hutch (the top of the sideboard section) will become the top of the mantelpiece, so take care when you are separating the top and bottom sections. Remove any labels from the back of the hutch, and use your sturdy craft knife to cut below the wide piece of wood, carefully separating it at the glue line across the top of the lower section of the back and sides, and along the seam beneath the countertop at the front. Some of these hutches will simply separate with careful pressure, as they are usually not glued towards the front, but only on the back and sides. When you have the two main pieces apart, sand off the glue residue from the flat section. This central flat piece will become the top of your mantelpiece. With the hutch in two pieces, set aside the bottom section for some other use, and remove the window fronts, by holding the hinged edge at the top and twisting it gently in toward the center of the hutch. The small metal pins that act as hinges for the windows bend easily, freeing the window. Wear safety glasses to make sure the hinge pin doesn't fly out and damage your eyes! Repeat this procedure with the second window to take them both off the front of the hutch without damaging the supporting framework. The glue most often used on these hutches will soften after a brief period in the microwave. Note: Remove the doors first, to remove the metal hinge pins before you place any of these pieces in the microwave to soften them and be very careful handling them after microwaving as the softened glue will be very hot. Free the Firebox From the Kitchen Hutch: To finish freeing your firebox from the kitchen hutch you have a few choices. You can simply twist out the shelf and leave the back of the box in place, covering it with a scale brick paper to line your fireplace, or painting it a mix of flat black and grey paint. Alternatively, you can remove the back to leave your fireplace open from the back, which may make it easier to wire into your scene if you will be using a glowing fire inset. To Remove the Back: Use your craft knife to cut the glue lines between the back and the sides of your fireplace. When these glue lines are free, turn the hutch so it is laying on its back and carefully cut through the back just below the top and bottom wood frame. Here, you must cut through the wood to free the backing, as the back is actually glued to the piece which forms the inner frame, cutting along the seam lines from the back to the inside, will not free the correct pieces. To free the back, only cut the top and bottom of the back section free by cutting it away from inside the box frame. Building a Firebox from Scratch: To build an equivalent firebox to your own set of dimensions, start by making a simple box. Cut two equal sides, remembering your mantelpiece will fit on top of your box, and your box will rest on the floor of the dollhouse. Cut a top and a bottom piece to fit between the two sides so that there will not be any wood joins visible on the side of the fireplace. Glue your basic box together and clamp it square, making sure you wipe off any excess glue. Your box will not have a back. Set it aside to dry. The top of the kitchen hutch (the bottom of the fireplace) is removed to make the inner details of the dolls house fireplace. Photo copyright 2009 Lesley Shepherd, Licensed to About.com Inc. This basic fireplace design gives you a lot of scope for trim. You can print off paper tiles and glue them to the firebox surround, covering the inner side surrounds with brick. You can glue jewelry findings to the side surrounds to add sculptural shapes, or make some from polymer clay and glue them in place to the sides or undermantel, then paint them. As shown here, the fireplace uses trim pieces cut from the basic hutch. The trim for the firebox sides and undermantel of the bashed hutch fireplace is made from the original top piece of the hutch. This is the piece with a rounded front, but no other routered detail. The more detailed section with the molded edge, originally in the center of the hutch, is left in place to become the fireplace mantel. Cut the plain, rounded piece of wood free of the fireplace by carefully cutting through the glue lines at the back and sides. If you prefer, you can leave this in place for a simple hearth, and use bookboard or new wood to trim the fire surround. Cut two side pieces which fit inside your firebox, running from top to bottom, and a piece which fits inside the firebox running across the top. Cut a piece to fit as a mantle on top of the firebox, and round the front and side edges of the overhanging mantle. The mantle shown has an overhang on the front of 1/4 of an inch, and the same 1/4 inch overhang on either end. To make rounded trim for the undermantel of your fireplace, clamp your ruler 1/8 inch in from the rounded edge of a piece of stripwood, at least as long as the width of your fireplace. The piece used for the bashed hutch fireplace is cut from the piece of wood with the rounded edge which was once the top of the hutch. Run your craft knife along the ruler carefully to cut free your half round trim. If you are scratch building a fireplace, you create rounded trim by sanding a length of stripwood to a half round profile, clamping it with a ruler, and using the ruler as a guide to cut the rounded trim free. If you are building your fireplace from bookboard, Cut a narrow 1/8 inch wide strip to use as trim. For both versions of the fireplace, cut a hearth from a piece of card (bookboard or illustration board) or wood, to fit flush with the front edge of your firebox. Overlap the outer sides of the box by roughly 1/4 of an inch, as far as the mantle protrudes on the top sides, and run along the outer sides of the firebox towards the back of the sides for about 1/4 of an inch. Most traditional hearths are not set only in front of the fireplace, but if it is easier, you can just cut a strip of card which runs along the front of the fireplace roughly the same length as the mantel and don't worry about taking the hearth back on the outer sides of the fireplace. Test fit the side pieces of the fire surround on either side of the firebox, sanding the edges flush if necessary. These pieces will be set back into the box by roughly 3/16 of an inch. Finally, cut the rounded trim (or line of card) to fit inside the firebox, forming a line over the lower edge of the undermantle piece at the top of the opening for the fire. When All Your Pieces Fit: Sand all the outer surfaces carefully with fine grit sandpaper (at least 120 grit or better) If you will be painting your fireplace, paint the pieces, leaving the edges which will be glued free of paint. Sand your finish, and glue your pieces together. If You Will Be Creating a Faux Wood Finish: Sand the pieces and finish them according to the finish instruction, allow them to dry, sand them, then fit and glue them together. Paint the bottom of the fireplace/ firebox with a flat black paint, then dab slight amounts of grey on it to resemble ash on a coating of soot. The hearth in front of the fireplace can be given a grey undercoat (for grout lines) then painted in a brick, faux slate, or tile pattern using acrylic paints. Paperclay, air dry clay or papier mache made from tissue can also be used to create a tile or stone effect, or you can create brick slips or tiles from polymer clay and glue them in place on the hearth. After your finish is dry, give it a coating of matte or semi-gloss finish to help protect it. You can also use the printable french tiles or geranium tiles to decorate your fireplace. Place your glowing fire in place (you can create a direct power or a battery operated one). To make an unlit version, use scraps of cellophane set in between logs or coals to resemble small flames. Print a suitable brick pattern on lightweight card or paper, or use charcoal grey flecked paper, or dark grey and emboss brick lines, and cut a section that will fit across the back of the fireplace, gluing it in place on the backs of the fire surround. If you fold the side edges back, then take the paper across the back of the fire, fold it and glue it tot the back of the other side surround, it will give you the effect of a square firebox. If you want a rounded effect, glue your patterned paper to the back of one side of the fire surround, curve the sheet and glue it to the back of the fire surround on the other side.